Apple continues to generate maps with some humorous stories. The next thing: it has collected the names of some streets in Kabul. Part of the database Apple maps is based on information obtained by OpenStreetMaps open platform, which anyone can access to help in its improvement. In fact, before Apple abandon Google Maps, OpenStreetMap had already used for other applications. Using an outdated database of OpenStreetMaps has played another trick on Apple. It turns out that some students from a university in Afghanistan decided to fill in the names of some streets of Kabul with titles 'clever', as "Mono Malo Street" or "MoJo Way". The grace of the students still can be found in Apple Maps. OpenStreetMaps realized this joke and changed the street names in its database, but Apple never make use of a database updated OpenStreetMaps. Hence names appearing as follow were created. Anyway, if you have a bad day, you can always open the Apple Maps application and explore the world to meet with pearls like this. 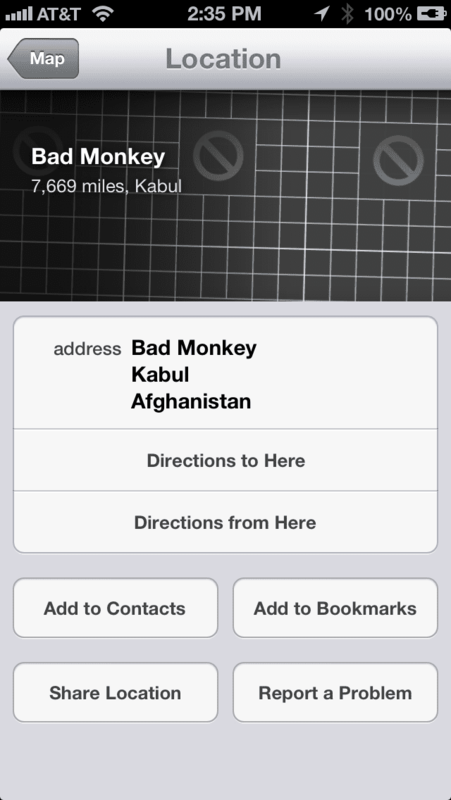 Article Another 'success' of Apple Maps: very peculiar street names was originally published in News iPhone .